Android is the recent fascination in the mobile and Smartphone arena. However, the field is also overwrought with an overwhelming number of options, with the increasing number of mobile giants launching newer models of Android enabled Smartphones. The latest in this line and competing for the top spot are HTC Sensation and Samsung Galaxy S II. A detailed comparison of both of these devices’ features, specifications, and affordability just might reveal the best choice. Surprisingly, the challenge in this case is quite stymied due to the similarities between the two devices. Some of the specifications that they share in common are 1.2 GHz dual-core microchips; both have the power to allow Full HD 1080p video at 30 fps due to their 8megapixel cameras. 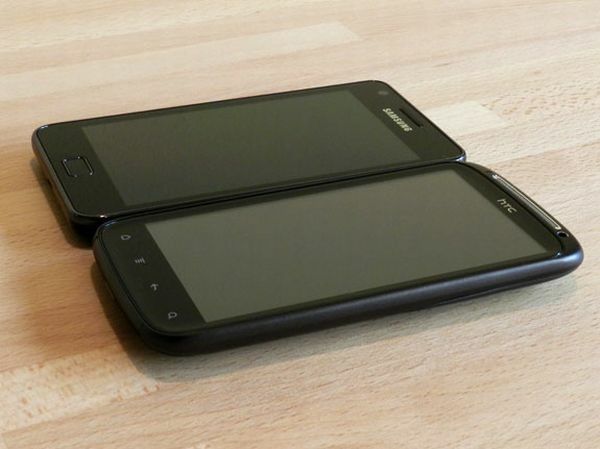 They have the same display screen size of 4.3″ and both sport the latest Android 2.3 Gingerbread operating system. They have individually powerful interface of Sense and TouchWiz overlays. However, the similarities end here and the real selection can only be based on the many differences that each of these sets has with each other. In addition, it will depend upon the users’ compatibility with the performance of these devices. Ease of use is probably one of the most important purchase attentive factors for most of the Smartphone buyers. These phones are not just mobiles; they can also be helpful in many ways and more importantly, they can serve the functions of many different devices such as a GPS device or a powerful digital camera. As such, the ease of operation is an important element for appraisal. Both HTC Sensation as well as Samsung Galaxy S II features their individual up-to date Android interface skins- HTC Sense 3.0 and TouchWiz 4.0 respectively. Of these two options, eh TouchWiz 4.0 is still generic enough to be considered an overlay on the Android Gingerbread user interface. However, the HTC Sense is more evolved and it definitely establishes the branded performance of HTC to go with your Android experience. The third generation range of Qualcomm Snapdragon with the patented Cortex-A8 Scorpion Cores powers HTC Sensation. The backup of dual core chipsets is a common feature for both the devices. Samsung Galaxy S II comes with the 1.2 GHz Samsung Exynos but they are paired with the more recent Cortex- A9 cores. Samsung Galaxy S II also takes the lead with a RAM of 1GB and a flash storage of 16 GB where HTC Sensation comes with only 768 MB of RAM and storage capacity of 8 GB within a microSD card. The numerous sets and product research surveys conducted on both the sets have proved that HTC Sensation leads the competition with admirable performance for daily browsing, page load and text reflow functions. However, Samsung Galaxy S II ran a close competition with high potential HSPA+ connectivity. HTC Sensation is supported by the Sense user interface, which gives it the leading edge in offline navigation too. HTC Sensation is heavier of the devices but it is also much more ergonomic and it has been surveyed to be easier to handle (palm friendly). Samsung Galaxy S II is thinner and the effect is edgier. However, HTC Sensation takes the lead in this area due to increased user friendliness. HTC Sensation also takes the lead with the superior resolution courtesy of using a normal RGB Matrix supporting the qHD resolution. However, it is also true that the design compatibility will largely depend upon personal preferences. Some people might prefer the edgier, lighter design of the Samsung Galaxy S II. In the strictest sense, HTC Sensation does take the lead with most of the attributes. Barring some areas where Samsung Galaxy S II might have the upper hand, a thorough picture of all functionality and attributes lean towards HTC Sensation as the final winner. It is very important to highlight that the immeasurable competition between these two devices was extremely back-to-back. Even after the complete evaluation and appraisal of all the features and attributes, a trace of conflict remains, that can turn the choice either way. It is mainly dependent on personal preferences and user compatibility. However, HTC Sensation gives the power packed performance and maneuverability that you can associate with the price that you pay for the device. The features are oriented towards making the Android experience a delight rather than an effort for the users. Yet, Samsung Galaxy S II takes the lead in some of the major sections such as the battery backup, memory, as well as the updated chipsets. The final decision can be influenced by any of these reasons, however, both of these devices are the high technology, and trend oriented sets of their field. What are Samsung Vibrant Specs? Where to get my Sanyo phone serviced? ← hi .. m gurdev singh frm hyderabad .i want to buy a phone fr 12k n m specialy intrested in android so.. plz suggest mee .